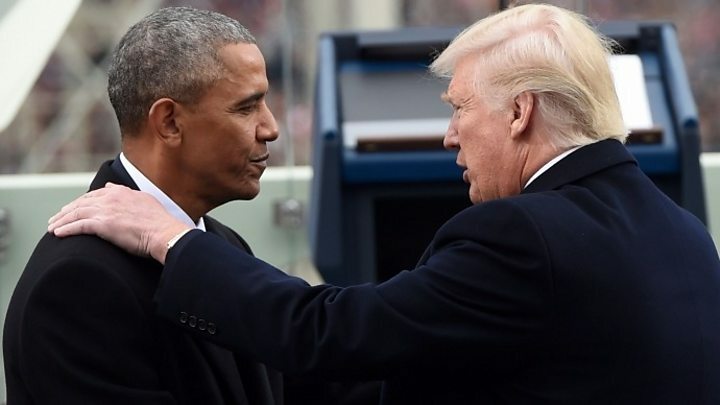 US President Donald Trump has suggested that President Barack Obama did not call his chief of staff's family when their son was killed in Afghanistan. Gen Kelly's son, Robert, 29, was a first lieutenant in the Marines when he stepped on a landmine and died in 2010. The president's claim has sparked outrage among Mr Obama's former aides. "You could ask Gen Kelly, did he get a call from Obama?" Mr Trump said in an interview with Fox News Radio's Brian Kilmeade on Tuesday. "I don't know what Obama's policy was. I write letters and I also call," he contended, adding that he has called "virtually everybody" during his time in office. 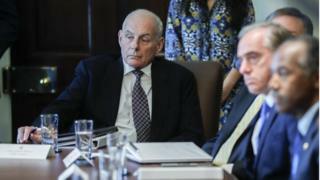 Gen Kelly, a retired four-star Marine general, has avoided speaking publicly about his son's death, according to US media reports. However, White House visitor logs show Gen Kelly attended a breakfast Mr Obama had hosted for families of those killed in action six months after his son died, the Associated Press news agency reported. The president's remarks came a day after he falsely said that Mr Obama and other presidents did not call the families of soldiers who were killed in action. Mr Trump made the claim as he was asked by a reporter at the White House on Monday why he had not yet contacted the families of four US soldiers who were killed in Niger on 4 October. The president slightly backtracked on his assertion later in the same press conference. "I don't know if he did," he said of Mr Obama. "I was told that he didn't often, and a lot of presidents don't. They write letters. I do, I do a combination of both." He said he had written letters to the families and planned to call them soon. Later on Tuesday, the White House said he had spoken to the families, but did not say when. President Trump "offered condolences on behalf of a grateful nation and assured them their families' extraordinary sacrifice to the country will never be forgotten," said White House press secretary Sarah Sanders. The comments prompted backlash from some Obama administration aides. Alyssa Mastromonaco, the former deputy chief of staff for operations under Mr Obama, fired back in a tweet, calling Mr Trump a "deranged animal" for making the claim. A spokesman for the Democratic National Committee, Brian Gabriel, said Mr Trump had told "a totally irresponsible and disgusting lie". Gen Kelly has yet to comment on the president's latest remarks. But Ned Price, a former spokesman for Mr Obama, called on Mr Kelly to stop "this inane cruelty".